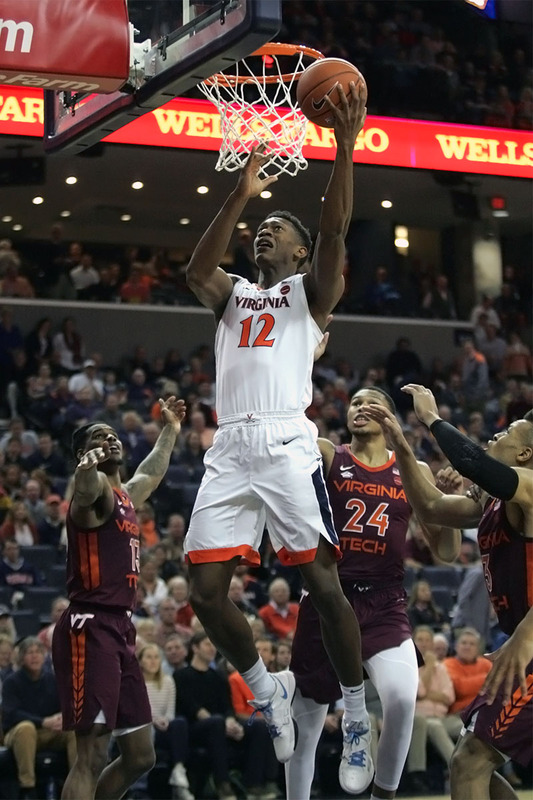 Twice already in 2019, a top 10 ACC opponent has rolled into the John Paul Jones Arena ready to duel Virginia in a showdown between heavyweights in the national rankings. Twice, the opponent has left the building dismantled and discouraged by a dominant showing from the Hoos. Just 10 days after then No. 9 Florida State got blasted by the Cavaliers, new No. 9 Virginia Tech suffered the same fate. Virginia jumped out to an early lead Tuesday night and rolled to a convincing 81-59 win. UVA’s offense warmed up quickly in the first half and never really cooled off. The Hoos led by 22 points at intermission and maintained a comfortable edge all the way to the buzzer. Indeed, the Hoos spread the wealth in the win. Six different players scored at least 7 points with three in double figures. De’Andre Hunter led all scorers with 21 points to go with 5 rebounds and 2 assists for good measure. Kyle Guy added 15 points and 5 rebounds with another strong shooting night when he went 3 of 5 behind the arch. Ty Jerome, meanwhile, ripped apart the Hokies all night long to the tune of 14 points and 12 assists. Kihei Clark chipped in 9 points, while Jay Huff and Braxton Key contributed 7 each. Virginia shot 58.5% (31-53) in the game thanks in large part to stellar passing. The ball zipped from one place to another and, with Jerome’s JPJ record 12 assists setting the tone, the Cavaliers tallied 18 assists on 31 made shots in the win. When the ball wasn’t swinging from one Hoo to another, it settled with playmakers and particularly Hunter, who the Hokies simply couldn’t slow down. He made 8 of 12 shots and put pressure on the visitors from a variety of spots. In the end, Virginia Tech spent most of the night feeling like a Wonderland rabbit. A step behind or a little too late to do much about a Virginia offense that was clicking. The Cavaliers certainly put stress on the Hokies from the beginning in this one. They jumped out to leads of 5-0, 11-4, 21-12, and 26-14 in the first 12 minutes. 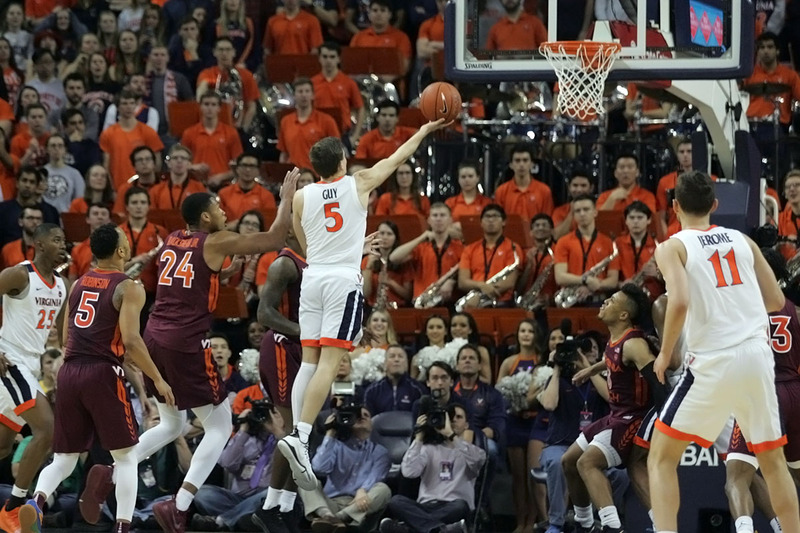 When the advantage first surged into double digits on a Guy 3-pointer, it prompted a Virginia Tech timeout with 8:24 to go in the first half. By then, however, things were already humming for the Hoos. Guy became the fourth player to make a triple on that shot and it was the sixth made 3 of the half to boot. By halftime, Virginia had knocked down 10 of 14 3-pointers (71.4%) and the lead had grown to 44-22. In last year’s loss to Tech at the JPJ, the Hoos had 49 points in 40 minutes and they were close to that in just one half this time around. Jerome’s fingerprints were all over the first-half display on offense. He either made or assisted on nine of the 10 first half 3’s. That included a buzzer-beating triple to end the half from Clark, who Jerome set up in the corner after pushing the ball up the floor following a defensive rebound. While the Wahoos were clicking on offense, the Hokies couldn’t get on track in the first half. They made just 7 of 20 shots (35%) and 2 of 9 3-pointers (22.2%) in the first 20 minutes. They corrected course in the second half by making 12 of 24 shots (50%) and 5 of 12 triples (41.7%), but the halftime deficit was too big to overcome. Nickeil Alexander-Walker led his team with 19 points on 6-of-10 shooting, while Ahmed Hill added 14 points. Ty Outlaw and Justin Robinson added 9 and 7, respectively. By smothering Virginia Tech in the first half and controlling the win, Virginia set the table for yet another top 10 showdown this weekend. Even though Duke lost to Syracuse on Monday night, the Blue Devils entered the week No. 1 in the Associated Press rankings, while the Hoos opened the week in the top spot in the coaches’ poll. The Cavaliers will head to Cameron Indoor Stadium after winning there a year ago and with a win in their last meeting against every ACC school currently.